Many industries invest in high-value mobile equipment; they also must invest in protecting it from fire. Protecting equipment and vehicles with the ANSUL A-101 Dry Chemical Fire Suppression System helps avoid costly repairs and replacement, keep insurance costs down, reduce downtime and prevent serious, life-threatening injuries. The ANSUL A-101 fire suppression system is ideal for use on mobile equipment used in surface and underground mining, forestry, waste management, construction and other industries. The system discharges proven ANSUL FORAY Multipurpose Dry Chemical Agent, quickly knocking down and suppressing Class A, B and C fires. With tank capacities from 10 lb to 250 lb (4.5 kg to 113.4 kg), the A-101 fixed nozzle system can be designed to flood entire volumes with dry chemical agent or aim at specific high-hazard areas. Additional system features include rugged construction, manual and/or automatic detection and actuation, an extreme temperature option, a variety of agent tank options and a low-profile tank option for underground mining environments and other applications where space is at a premium. The CHECKFIRE system is used with the A-101 system to provide around-the-clock, automatic, fire detection and actuation. The rugged control module is designed to withstand shock, vibration and extreme environmental conditions. The CHECKFIRE system includes supervised circuitry, adjustable shutdown, discharge time delays and auxiliary shutdown relay. The LVS Liquid Agent Fire Suppression System utilized in a stand-alone system protects off-road equipment such as above-ground and sub-surface mining equipment, including haul trucks, wheeled loaders, dozers, scoop trams, and shuttle cars. The system is also well suited for other off-road vehicles such as landfill equipment; forestry vehicles; construction equipment; and specialty vehicles such as slag pot carriers, iron/steel slab carriers and tunnel boring equipment. Additional applications include on-road vehicles such as public transportation, waste management, over-the-road trucking, and cargo transport. LVS agent is a wet chemical agent that is a unique blend of organic and inorganic salts, coupled with surface active ingredients. This blend provides a strong measure of freeze protection along with the foaming properties associated with conventional Class B liquid agents. The agent flows readily into areas where flammable liquids may settle. It provides both fire suppression and superior cooling of superheated surfaces while blanketing the fuel and cutting off oxygen to help prevent reflash. 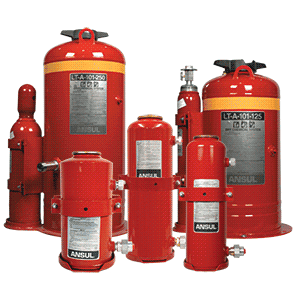 LVS is part of the ANSUL fire suppression system designed to suppress fires in mobile equipment used in a wide range of industries, underground and surface mining, forestry/logging, construction, waste management, metal processing, transportation, power generation, agribusiness, and others.